A stunning pendant with a gold sheer shade and an antique brass finish. The Eglo Tenno Pendant Light in an antique brown finish complimented by genuine lead crystal is equally suited to traditional and transitional settings. This unique linear pendant is approximately 29" wide and the drop is adjustable to a maximum of 59" when fully extended. It will be stylish and functional when used as an island light or as a dining room fixture suitably positioned over a table. Use five G9 type bulbs, max. 40W each included for your convenience. This hanging light fixture can be used with any standard 120V dimmer for the widest flexibility of light output. This vintage hanging caged pendant light kit adds a vintage industrial feel to any room - fashioned after factory lighting. This pendant light kit features a fully adjustable 65 inch cord allowing for full customization based on needs and style . This hanging ceiling pendant light kit is fully dimmable, allowing you to customize lighting ambiance and mood.. ideal for use in kitchens, restaurants, bars, and dining rooms - the exposed bulb in this fixture deliver the perfect look. Features all mounting hardware for quick and easy installation and requires one 60W vintage light bulb (sold separately).Includes all mounting hardware for quick and easy installation and requires one 60W equivalent light bulb (sold separately). Fashioned after factory and barn lighting Globe Electric's Flo 1-Light Pendant adds a modern industrial feel to any space. This hanging ceiling pendant can be fully dimmable, allowing you to customize lighting ambiance and mood. Ideal for use in kitchens, restaurants, bars, and dining rooms - the exposed bulb in this fixture delivers the perfect look. Includes all mounting hardware for quick and easy installation and requires one medium base 60W light bulb (sold separately). Rustic and vintage dicor can transform your home into a nostalgic retreat reminiscent of rural farmhouses. Exposed iron details and a faux-painted wooden plank support artful, clear, seeded glass shades. Combine with vintage-style light bulbs to create a romantic focal point for any room. 22 Inch Pendant Antique Brass Fixture With Gold Shade A stunning pendant with a gold sheer shade and an antique brass finish. 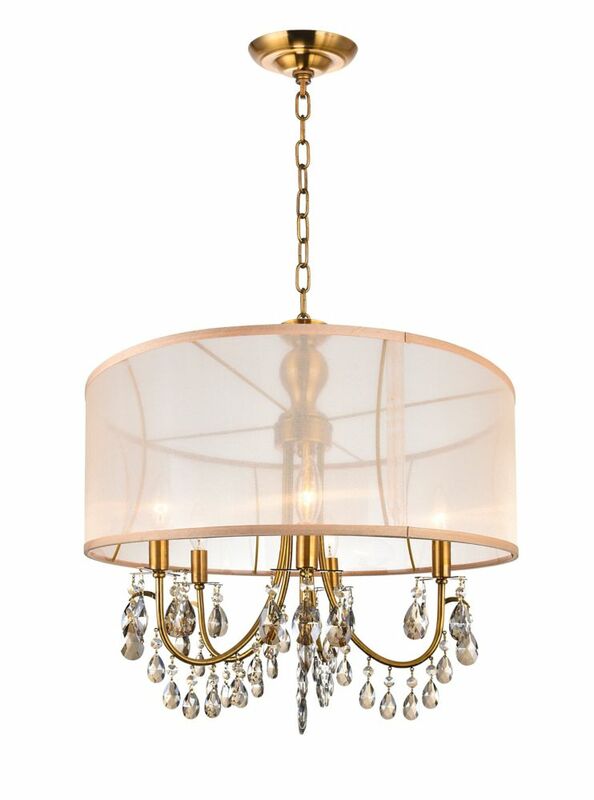 22 Inch Pendant Antique Brass Fixture With Gold Shade is rated 4.0 out of 5 by 1. Rated 4 out of 5 by Lpal1229 from Pleasantly Surprised! I absolutely love this chandelier! Was a little worried about ordering something that had no reviews, but so glad I did. The color is a deep gold and the crystals have an Amber tone to them not clear as is pictured. Also, the drum base is a shimmery gold and was a lot bigger than expected. Once installed though, it’s the perfect size. The crystal are pretty but the hooks are a big cheap looking although you can’t notice it when they’re hanging. One of the crystals was cracked towards the top but I put it in a spot that’s not noticeable. Also, I had this shipped to the store for a quicker delivery and the box was pretty beat up. Be careful of the styrofoam that gets everywhere when you take it out of the box.